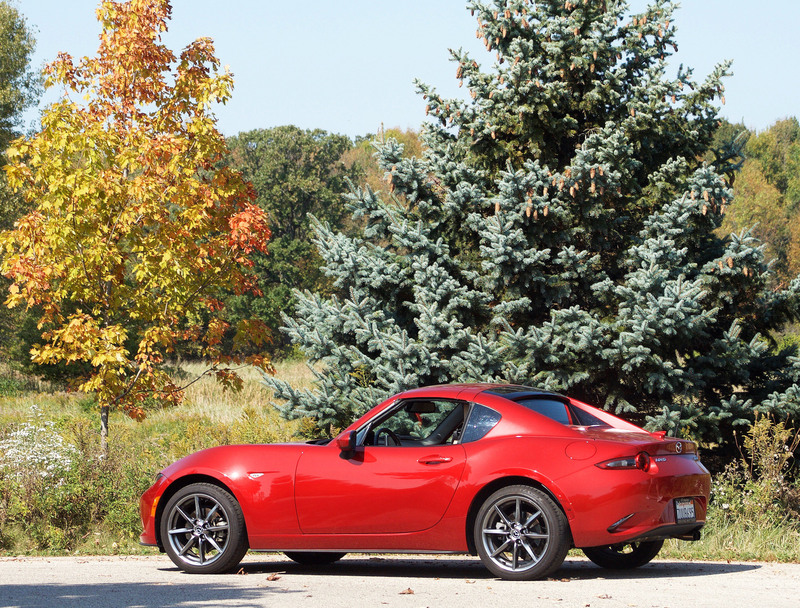 Love may be what makes a Subaru a Subaru, but Mazda’s MX-3 Miata has been luring drivers into its open-air summer of romance for 28 years, yet seems never to age. That was with its soft-top model, but now comes its RF (retractable fastback) with power folding hardtop, and suddenly love turns to lust. 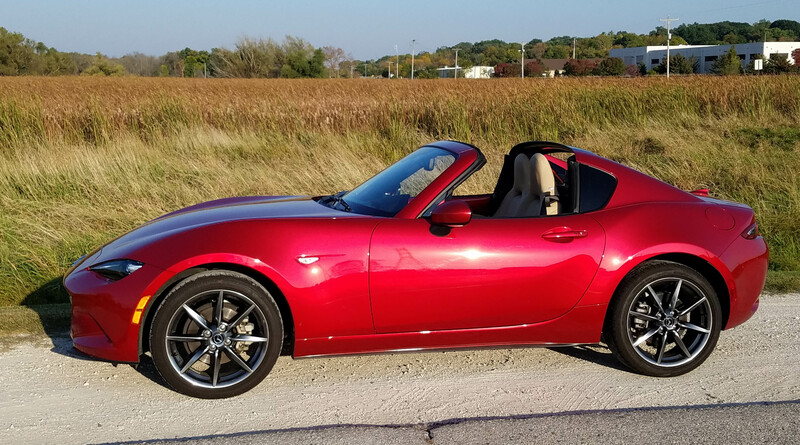 While there has been a power hardtop model before, this one improves the Miata’s looks. Cosmetically it adds a Targa-like bar behind the cockpit that remains there after the roof has neatly folded down behind the seats. Think Porsche Targa profile, but much cuter and less costly. Hold up a toggle on the center stack and in slightly more than 10 seconds the folding hardtop has powered down to transform the sporty metallic red roadster into a convertible. Where the old soft top let in a lot of wind and road noise, the hardtop muffles nearly all of it. Ah, you can cruise in style and listen to your stereo without straining an eardrum. 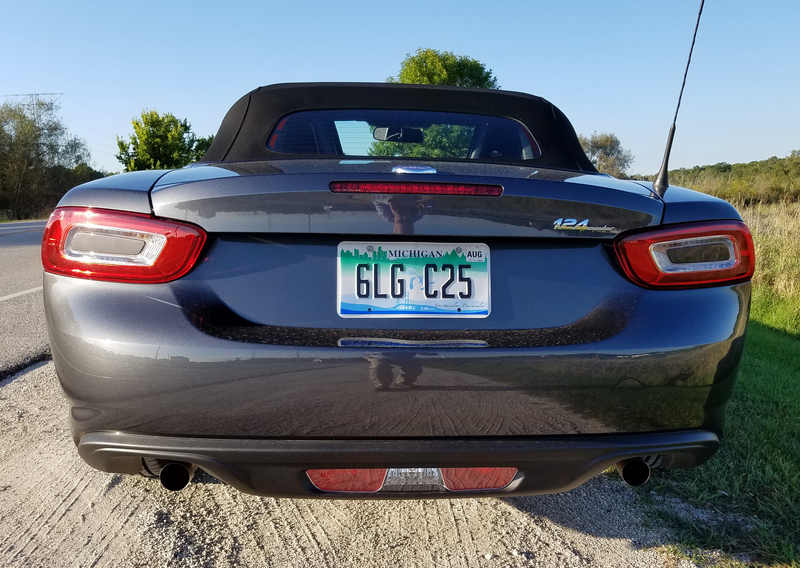 So the RF creates a quiet interior, resolving one of my few complaints of past Miata drives, plus creates a snazzier profile that had people asking me “What?” I was driving. Still Mazda continues its mission of creating a simple car, a convertible that’s affordable, fun and won’t embarrass you at the gas pump. Mazda calls it zoom-zoom. 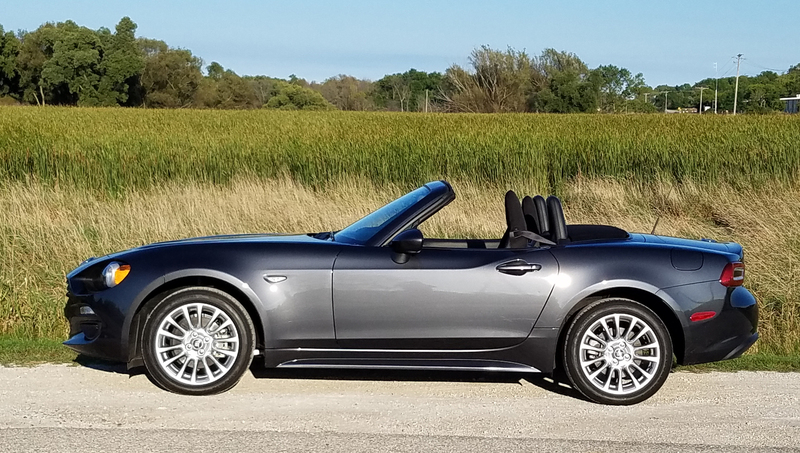 It has been a long, long time since an affordable convertible with Italian styling was available in the United States, but now we have Fiat’s 124 Spider. Actually, we had it all along, or at least since 1989, in the form of a Mazda Miata. The new Fiat is mostly Miata, not that there’s anything wrong with that. Ah, but there are differences. For stylistas who prefer a long hood reflecting the styling of previous Fiat Spiders and other Italian sports cars, Fiat’s restyling of Miata’s body will be alluring. And it is. The Spider looks longer and leaner than the cute, but edgy Miata. Yet there’s amore; I mean more. The 124’s headlights are round and taillights are rectangles, similar to the 1960s Spider, the ride is a tad smoother and well, plus there’s a bit more oomph under that long hood. Fiat uses one of its Multi-Air turbocharged 1.4-liter I4 engines to propel the roadster. That’s not a huge upgrade in the pony department, moving from Mazda’s 155 horses generated by its 2.0-liter I4 to 160 in the Fiat. But the torque, the oomph if you will, is more substantial at 184 lb.-ft. with the turbo. Dimensionally Fiat’s Spider is about 5 inches longer (most of it hood we suspect) and 100 pounds heavier. But what’s that among friends. Sports cars seem an endangered species and nearly as hard to find as polite political discourse. 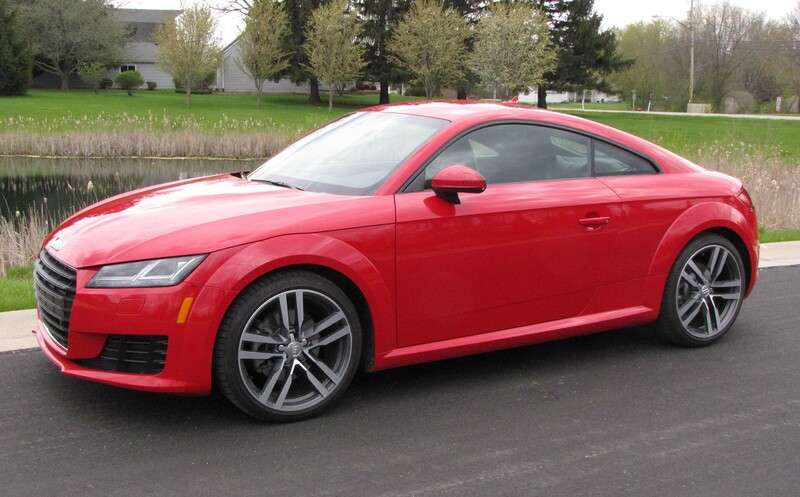 So my recent landing of a new Audi TT coupe seemed quite a coup. I hadn’t driven a TT for nine years. That’s how rare they are in the automotive test fleets. But this new third generation coupe was worth the near epochal wait. The TT still features a slick rounded roofline and low-slung squatty appearance that made it so darned appealing when it first launched in 1998. Yet this one looks more modern, what with its LED headlights and more aggressive nose. 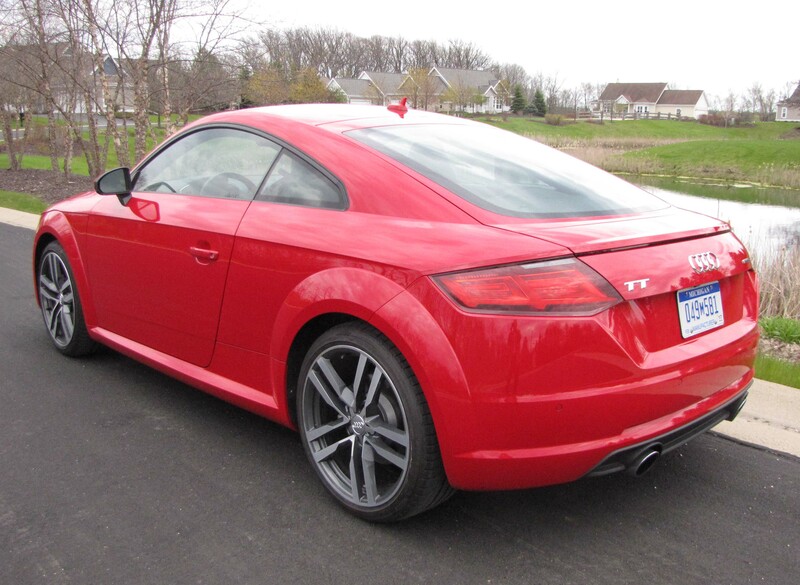 Looks make any sports car and the TT remains a head-turner. But luxury performance at a reasonable price has been its hallmark and Audi doesn’t stray from that formula. A sports car, for the uninformed, isn’t a supercar. 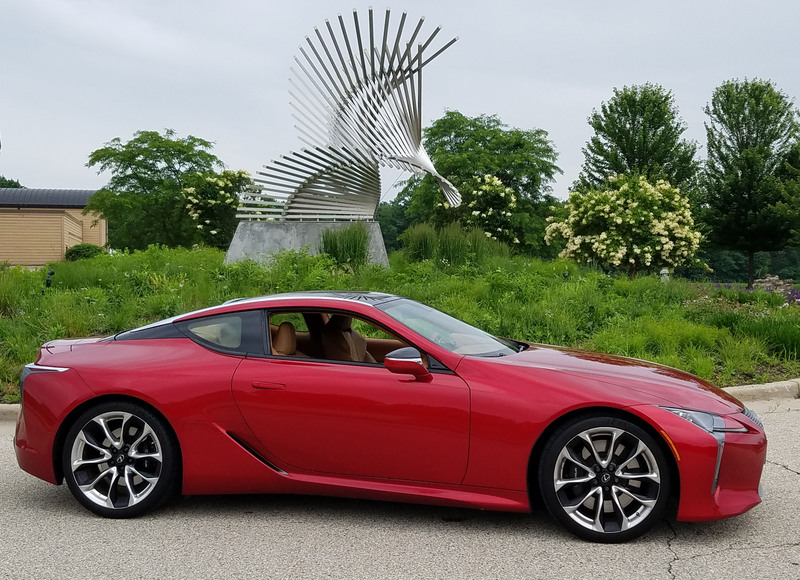 Sports cars are light and lively, the sort of car you can toss around corners and zip away from stoplights without squealing your tires and without a growling V8 sucking down another gallon of gas. England’s MG was one of the early two-seat sports cars that assumed almost epic popularity among enthusiasts in the United States after World War II. Returning GIs who had seen the small, sporty, fun to drive MGs while stationed in England during the war desired the roadsters once they reestablished themselves after the war. Old WWII airports around the country were converted into race tracks and road racing’s popularity grew. So the nimble MGs became regular weekend warriors along with Austin Healeys, Jaguars, Sunbeams and Triumphs. 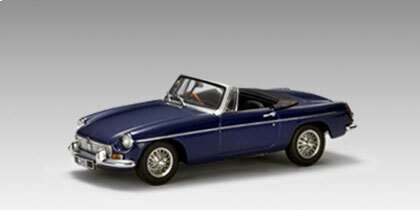 Autoart delivers a tidy 1:43 model of the 1969 MGB Mk. II roadster, the MGB being made from 1962 until 1980. MG began in Abingdon, England, near Oxford, in the early 1920s as Morris Garages, a Morris dealer, began making its own versions of the Morris cars. Design work came from Cecil Kimber. MG made cars for more than 50 years before falling on hard times and being sold to various auto-making entities. The name now is owned by a Chinese automaker. Mazda’s Miata wasn’t the first small drop-top to gain popularity in the U.S. market. 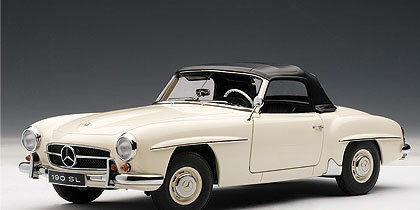 Way back in the 1950s and early ’60s Mercedes-Benz created an iconic roadster, the 190 SL. This wasn’t the first famous roadster either, but it was a big hit for Mercedes, and set the styling trend for upscale two-seat convertibles for the better part of a decade. Autoart’s 1:18 version is bathed in a creamy white finish that accentuates its smooth elegant lines, lines that captured well-off driver’s attention, and cash, during those heady classic sports car years.